(*) Written in the order Japanese use: surname - name. Haruka may at first seem to be a cold, careless person, who only cares about her mission and likes hurting people, but this is only a mask. Haruka is really a torn soul. She's willing to sacrifice three persons for the good of the world, but if you think about it, she has already sacrificed someone: herself. She's given up all her dreams, her ambitions, her hopes, her innocence, and would even give up her love and her own life to accomplish a mission and a destiny she never wished for. Her head says that what she's doing is right, but her heart does not agree. 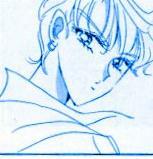 Thus, Michiru sometimes has to restrain her to prevent her from saving the victim-of-the-day *before* their heart crystal had been extracted (see ep. 92). Everytime she says out loud that three persons have to be sacrificed, she's saying it to herself more than to the person she's talking to, in an attempt to cancel the intense guilt and self hatred she feels. This is also why she rarely lets people get close to her: in case they had one of the talismans, she would feel less hurt, not knowing who she was letting die. This is why I admire her so much. She must have an immense courage to go on with all her hopes shattered, and no way to get free from guilt. If she didn't find the talismans, and the world came to an end, she would die with the guilt of having caused the death of everyone, but if she did find the talismans, she would continue living with the guilt of having killed three innocent people with her own hands. She doesn't believe her heart is pure -- and yet it is, pure enough to be a talisman. She has one of the purest hearts, having self sacrificed herself from the start, and if you think about it, its pureness is her only escape from her guilt. Dying this way, she wouldn't suffer the guilt of not having saved the world when she could, nor would she have to survive with the guilt of having killed three innocents. Because of this, IMO, her heart was a talisman: to give her an escape.